Become the White Rabbit when you put on this deluxe White Rabbit hat and lead Alice to Wonderland! This is a licensed Alice in Wonderland accessory from the Tim Burton film! The plush hat has two ears which are adjustable in shape, are lined with pink and have vein accents. A size adjuster on the inside makes it a great hat for kids and adults. A hidden pocket is also on the interior. 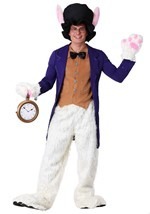 Great on it's own or part of an authentic White Rabbit costume!